In a post published on May 2, BuzzFeed writer Lauren Yapalater asked readers to weigh in (via a quiz) on the right meaning for IMHO; is it “in my humble opinion” or “in my honest opinion.” The post went viral, with more than 90,000 votes. BuzzFeed wants people to keep voting—but this time with their money— with two t-shirts that have the different meanings for IMHO.The “IMHO” shirts will retail for about $20. BuzzFeed, the media queen of viral content on the internet is back at it again with a new debate on the right meaning for the acronym “IMHO.” Only this time, it’s also turning the moment into merchandise. 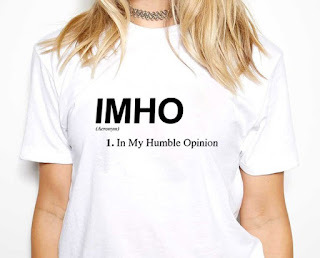 In a post published on May 2, BuzzFeed writer Lauren Yapalater asked readers to weigh in (via a quiz) on the right meaning for IMHO; is it “in my humble opinion” or “in my honest opinion.” The post went viral, with more than 90,000 votes. BuzzFeed wants people to keep voting—but this time with their money— with two t-shirts that have the different meanings for IMHO.The “IMHO” shirts will retail for about $20. The commerce team decided to turn the quiz into merchandise late in the day. Kaufman shared that the only other time the company’s done something like this, is with the release of BuzzFeed branded garbage cans, after then President-elect Trump called the company “a failing pile of garbage.” Based on the internet’s reaction so far to the “IMHO” debate, the T-shirts could end up being a big hit.